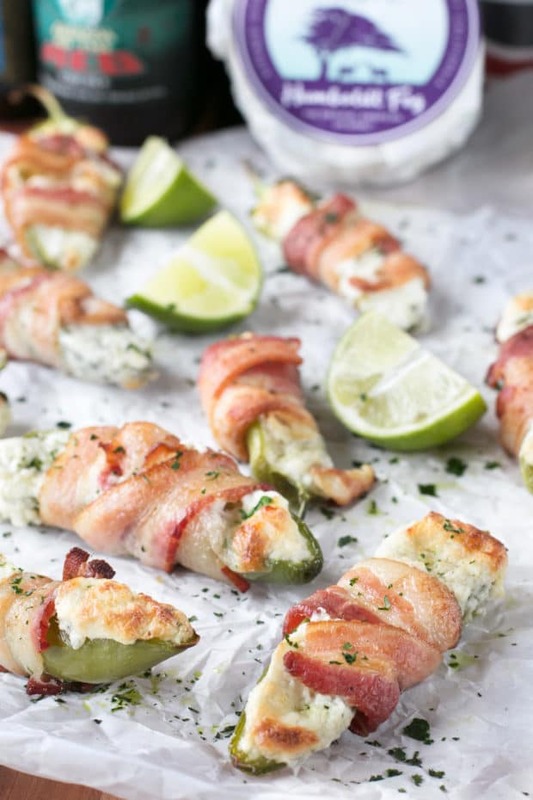 For an easy tailgating appetizer that packs in the flavor, reach for some Goat Cheese Stuffed Bacon Wrapped Jalapeños. The smoky bacon wrapped around goat cheese stuffed spicy peppers is an explosion of savory, indulgent heat to help you cheer on your home team! Throw them on the grill or bake them up at home – either way, you’ve got your next tailgating party covered. For most people this is the start of a pumpkin obsession, but for me, September signifies a more important milestone… The start of tailgating season is almost HERE! 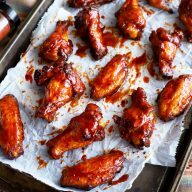 To celebrate just how close tailgating season is, and to give you a little something to whip up over Labor Day weekend (all in the name of tailgating preparation, right? ), I decided to whip up an appetizer that never EVER gets old. I’ve told you time and time again just how much I love anything cheese-related (specifically goat cheese-related). Remember when I made that waffle fry poutine I made? Case and point, right there. Of course, when I am reaching for goat cheese, there’s only one brand that speaks to my heart and soul… Can you guess which one that is? Oh you guessed it alright… It’s Cypress Grove cheeses! Their Humboldt Fog cheese has been something I have sung praises about for years, ever since I really got back into this whole cooking thing. I’ve actually never cooked with it because it’s always been one of those cheeses I would savor on toast and crackers as a special treat. 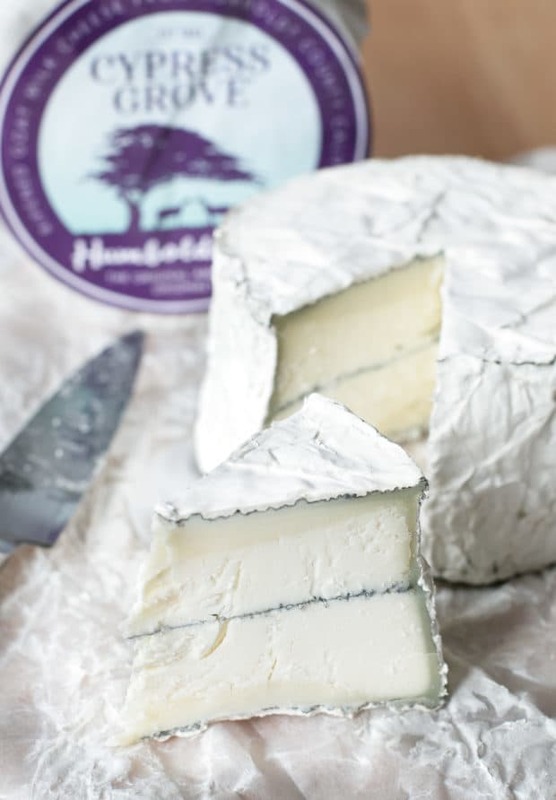 Humboldt Fog is SO much more than just a special treat. It’s really versatile in several recipes, including this one! The soft-ripened goat cheese features a gorgeous ribbon of edible vegetable ash, making the cheese truly unique. It’s creamy, it’s fresh, and it’s slightly herbaceous. So naturally I stuffed it in jalapeños and wrapped them in bacon. 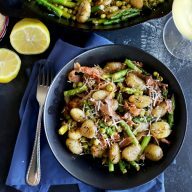 The creaminess of the cheese paired with heat and bacon really brings all those gorgeous flavors to the forefront. In each bite, you feel like you are melting into a kaleidoscope of flavor. That’s right, I said “kaleidoscope of flavor.” That’s how serious I am about this recipe, mmkay? You can roast these peppers in the oven, or if you are grilling in the parking lot before the game, simply throw them on the grill! Either way, the flavors of all the ingredients sing a symphony of flavor that you’ll never want to press pause on. 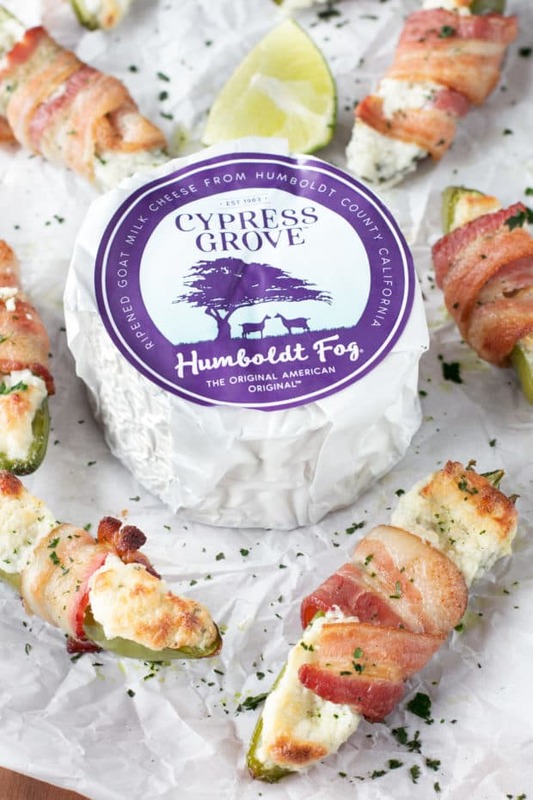 To make this recipe right, you HAVE to get your hands on this Humboldt Fog cheese from Cypress Grove! to mix the stuffing for the jalapeños properly (and easily!). to get extra charred flavor into your jalapeños! 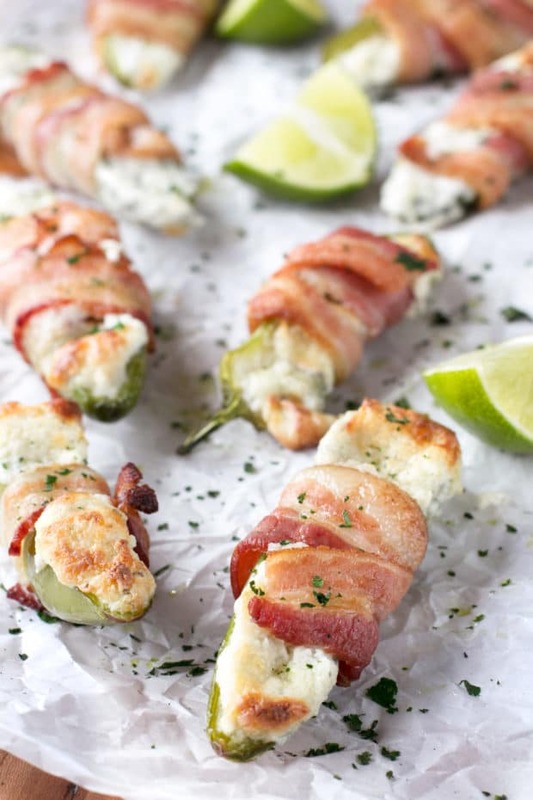 Pin this Goat Cheese Stuffed Bacon Wrapped Jalapeños recipe for later! 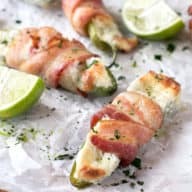 Spicy jalapeños are stuffed with a goat cheese and cream cheese combination, wrapped in bacon and roasted until the bacon is crisp and the cheese is gooey. Perfect for any tailgating festivities you have coming up this season! 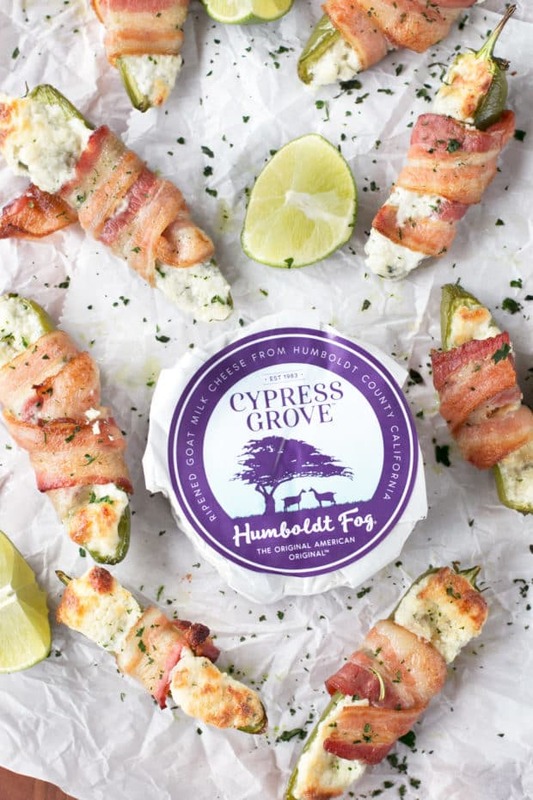 In a medium bowl, mix together Cypress Grove's Humboldt Fog cheese, cream cheese, garlic, salt and pepper. Fill the jalapeño halves with the cheese mixture, making sure to fill them to the top. 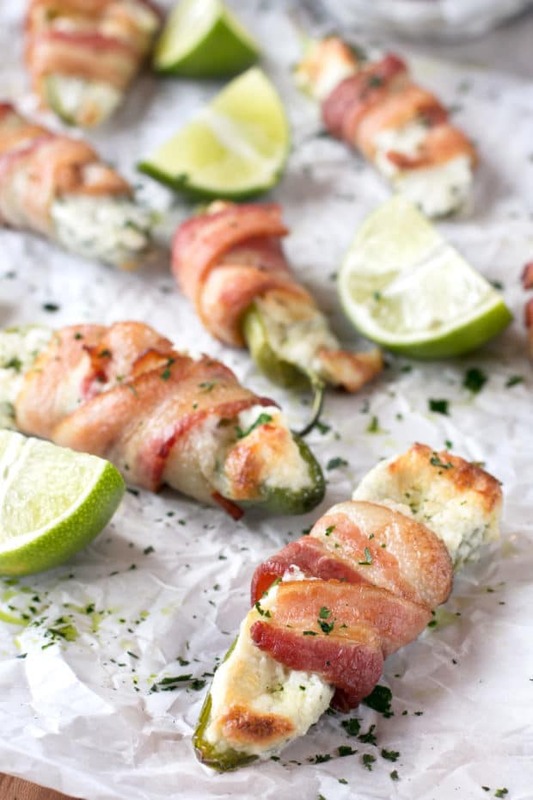 Wrap each stuffed jalapeño with half a slice of bacon, securing both ends with toothpicks. 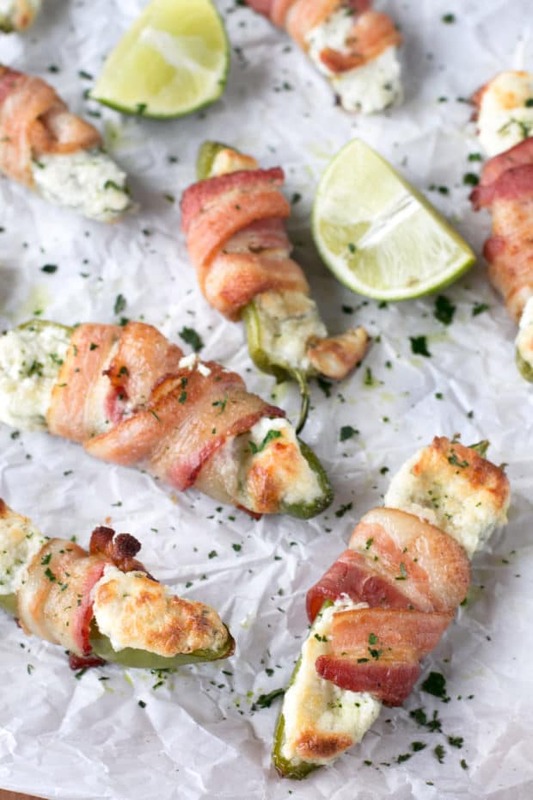 Add stuffed jalapeños to a rimmed baking sheet lined with parchment paper. Bake for 25 minutes, until the bacon is cooked through and crispy. You can also grill these jalapeños for 15 minutes for extra charred flavor! Hellloooooo delicious! 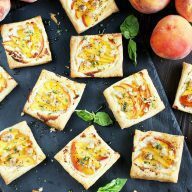 These are seriously genius– LOVE the idea of a goat cheese popper! But who wouldn’t amirite?